Well, we are always thinking about how to make your big day extra special and this time we bring to you the latest and the biggest trend in weddings! Band Baaja Cinema is a unique venture which promises to make your wedding day video a special affair by screening it at a theatre! Yes, your very own wedding films premiere. Isn’t that exciting? To spice things up, they also have a contest which can help you win this honour and have a screening for free! (T&C Apply). Simply Like, Comment and Share their Facebook page and send your details here to enter! We sat down for a chat with the founders to know more about this exciting new trend in the market! Tell us about Band Baaja Cinema! 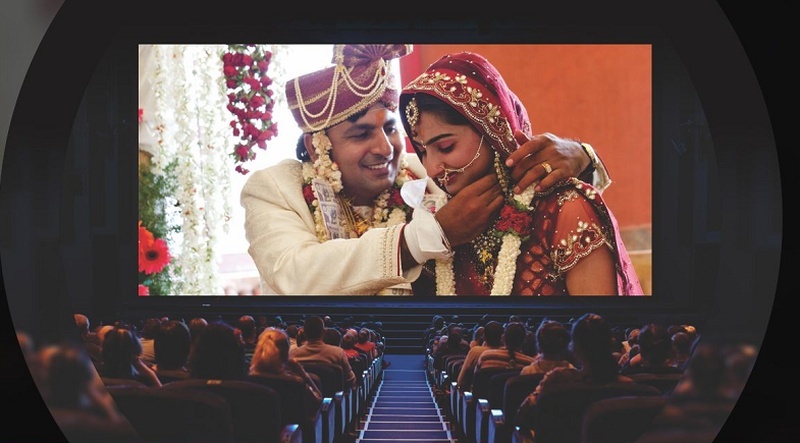 Band Baaja Cinema introduces India's first "Premium Cinematic Wedding Experience”. You can get your precious Wedding Film and Wedding Album Screened for first time on Big Screen in Cinema of your choice for your loved ones, family and friends. Feel the Larger than Life experience and enjoy higher quality visuals of your precious moments. We are offering a enigmatic service where in the discerning Clients (Bride/Groom with their families and friends) can view their Wedding Film and Wedding Album on Big Screen in nearby Cinemas along with delicious Food and Beverages. We can also include the client's precious old family photos/videos to make the day more memorable. With technological innovation like 2K, 3D projection we are carrying the realms of creativity and expression to showcase wedding film for the discerning couples .We convert High quality Wedding Film into a DCP (digital cinema package) which is playable in commercial cinemas. We can even showcase the Wedding Film in 3D (if shot in cinematic 3D) in 3D equipped Cinemas. We are associated with most of the Cinemas across India and abroad for booking. Band Baaja Cinema by Jive Media Works is a new innovative and energetic media company catering to services in Cinema, Film, Media & Entertainment industries where we think out of the box and deliver smiles to customers. A Team of professionals with 10+ years of experience and executed various Cinema /Films/Media related projects in India and abroad. How was Band Baaja Cinema born? While at a family gathering in our hometown, we were watching old photos and wedding videos on a small screen with a projector. The video quality wasn’t that great and the screen was small, making the experience barely memorable. We couldn’t go back and re-do the videos but we decided to offer this unique concept to soon to-be-wed couples so they don’t miss the opportunity. Our aim is to help them experience their wedding videos on the big screen with great pictures and sound. What should couples keep in mind before signing up with Band Baaja Cinema? They will get the best services and the opportunity to experience a memorable affair with their precious wedding film being screened on big screen. We simply arrange the theatre and screen the wedding film. We do not tamper with the video and thus the quality remains the same. What are some of the packages you offer and what is the starting range of these packages? The package depends on the choice of cinema and number of people attending the event and the day and time of the event. Screening packages on Weekends/holidays are on the higher side and the general package starts from Rs. 50,000. This does not include the mastering charges as this is introductory offer and mastering is free at the moment till further notice. Click here for all you need to know about Band Baaja Cinema. What's coming up next? Any other exciting ventures in the pipeline? As a Wedding Video aggregator we will be introducing app based wedding video projects. Couples don’t have to wait for months to get their final Wedding Video and the time will be reduced to a minimum so the newly wed couple can review their video shortly after the wedding. We are also introducing 3DShaadi.com which is a new virtual reality (VR) based technology and offers the experience of watching live weddings anywhere in the world. So if you really cannot travel miles to attend a wedding you can feel it Live. Now, that’s what we call innovation! So, what are you waiting for? Sign up for the contest now!